For 2 days now I've been using my Zombies, Run! app (mentioned in my last post). It has made running more... fun? I say that with a question mark because it's not really something I would expect myself to say. Running isn't fun. It's torture. It starts off with a helicopter crashing after it was shot down on the way to Abel Township. You hear Sam (communications operator for Abel) talking to you over a radio you picked up and he guides you to the base. You go to the hospital to grab supplies and make it to the base. Any supplies picked up along the way go towards building up the base and for each of the supplies increases the population. I'm going to keep running because I want to see where the story goes. I set it to 30 minute missions, meaning that the radio transmissions (the story) come in between the music. 60 minute missions are also an option and the radio transmissions come between every couple of songs. You can create a playlist and it will play it over the Abel Township radio. A problem with this is that you can't skip songs. The first day it wasn't a problem because I made a playlist but I didn't think about the fact that it plays the songs in order. So 2 days in a row of the same songs made it kind of boring. This is easily fixed by switching up the playlist before I run. Also, I'm running on a treadmill so I turned the GPS off, meaning that it doesn't track my distance, only the time elapsed. Not a big deal, overall but I'd like to know distance as the display doesn't work on my sister-in-law's treadmill (that she is awesomely lets me use). The story is a good one so far. I'm interested to see what happens next. You become the next Runner 5 because thy just lost the previous one. The story takes place in England (where the app was made), which won't take you out of the story if you don't focus too much on it. I kind of wish they could make a U.S. version, but I like English accents so... not really a problem. The voice actors are very good and the radio transmissions are entertaining, especially when they tell you they spot zombies on your tail. It makes me run faster when I'm told they're close behind me. 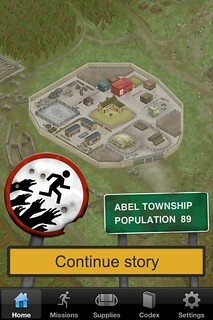 I will get in shape... while running from zombies.